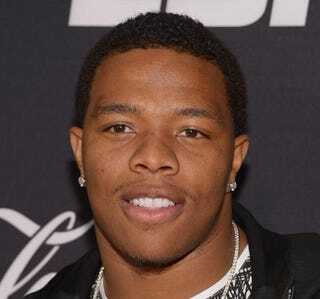 Ray Rice attends the ESPN the Party event at Basketball City on Jan. 31, 2014, in New York City. Baltimore Ravens running back Ray Rice, who was involved in a domestic dispute that included video footage of Rice dragging an unconscious woman from an elevator, will avoid jail time as long as he completes a pretrial intervention program, ESPN reports. Rice was accepted into the program Tuesday, and as long Rice attends the program for a year, the third-degree charge of aggravated assault will be dismissed, ESPN reports. Rice was charged with the assault after a Feb. 15 incident involving his then-fiancee, Janay Palmer, who is now his wife. According to reports, the two were arguing at the Revel Casino and Hotel in Atlantic City, N.J., when the argument turned violent. TMZ released security footage of Rice dragging an unconscious woman off an elevator before he was stopped by hotel security. Palmer also was charged in the incident. "We're very happy with the result. We're glad that the court and the prosecutor's office agreed PTI was the appropriate disposition for the case," Rice's attorney, Michael Diamondstein, told ESPN. "This decision was arrived at after careful consideration of the information contained in Mr. Rice's application in light of all the facts gathered during the investigation," prosecutor Jim McClain told ESPN. "After considering all relevant information in light of applicable law, it was determined that this was the appropriate disposition."